Key West is the most famous of all the Keys. Trying to write about Key West is like trying to dance about architecture - very difficult to do, but we will try. 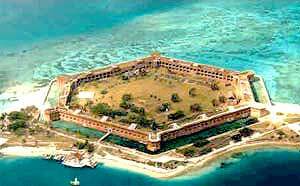 Let's start our tour 70 miles (113 km) west of Key West, at Fort Jefferson and Dry Tortugas National Park. The Dry Tortugas are a chain of seven coral reef islands. The Fort was built in 1846-66 to protect the Florida Straits at a time of conflict and rivalry between The United States, Spain, Mexico and other countries. The park is a great place for scuba, snorkeling, birdwatching, camping and just relaxing. Unless you fly there, a visit to the Dry Tortugas will take an entire day. 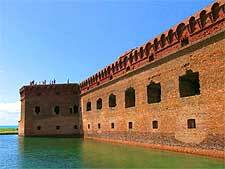 For more info on what to see and do out there, visit the very informative FortJefferson.com. Want more saltwater fun? The Key West Aquarium offers tours, shark-feeding, a touch tank and close-up views of grouper, moray eels, barracuda, tropical fish, tarpon, sharks, parrotfish and much more. The aquarium also has an interesting history itself, being built 1932-34 during the Great Depression. Back to Key West proper! A good way to get an overview of what's on offer during your visit is to take the Conch Tour Train. It operates every day and the tour length is 90 minutes (continuous tour, no reboarding). The Old Town Trolley Tours is operated by the same company that operates the Conch Tour Train. It is a similar program, but with free reboarding all day long. The Ernest Hemingway Home and Museum is a Spanish colonial style home that Hemingway owned from 1931 until he committed suicide in 1961. Flagler Station brings to life the history of Henry Flagler's railroad to Key West. 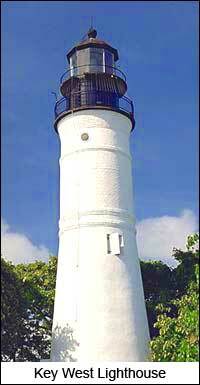 When the project began in 1905, Key West was the largest city in the State of Florida. Combating mosquitoes, hurricanes, labor problems, and the wilderness, workers took seven years to complete the railroad. The Key West Shipwreck Historeum Museum lets you relive Key West in it's bustling, early days, as well as see artifacts from shipwrecks (including the recently-discovered Isaac Allerton). The Key West Historic Memorial Sculpture Garden was established as a result of land set aside by the City Commission to create a permanent historical record of important people in Key West's history. Nancy Forrester's Secret Garden, on Whitehead Street, has a world-class collection of rare tropical plants and antique botanical & zoological prints. Also on Whitehead Street, you will find Audubon House & Tropical Gardens, which explores local history and folklore and offers a garden of tropical foliage. The Audubon House is very proud to have been chosen "Best Museum in the Florida Keys" by South Florida magazine. Fort Zachary Taylor offers guided tours daily of this fort that was constructed 1845-50 and played an important part in Florida's early devlopment. The area on the west side of the fort is ideal for fishing. There is a small beach area, as well as shaded picnic areas. Heritage House Museum & Robert Frost Cottage represents 200 years of Key West culture through the lives of the Porters, a notable Key West family which has lived on the island for seven generations. An excellent glimpse into the past! Historic Mallory Square is where many go in the evening for the sunset celebration. It also has shops and restaurants in a quaint setting. Truman's "Little White House" offers guided tours daily and a botanical garden. A very nice setting. President Truman spent a lot of time in Key West and helped put it on the map through constant references to it in the newspaper articles of the time.